"Art Young" is also the name of a DC Comics editor who co-founded the Vertigo imprint. Arthur Henry "Art" Young (January 14, 1866 – December 29, 1943) was an American cartoonist and writer. He is best known for his socialist cartoons, especially those drawn for the left-wing political magazine The Masses between 1911 and 1917. Art Young was born January 14, 1866, near Orangeville, in Stephenson County, Illinois. His family moved to Monroe, Wisconsin, when he was a year old. He enrolled in the Chicago Academy of Design in 1884, where he studied under J. H. Vanderpoel. His first published cartoon appeared the same year in the trade paper, Nimble Nickel. Also in that same year, he began working for a succession of Chicago newspapers including the Evening Mail, the Daily News, and the Tribune. In 1888, Young resumed his studies, first at the Art Students League of New York (until 1889), then at the Académie Julian in Paris (1889–90). Following a long convalescence, he joined the Chicago Inter-Ocean (1892), to which he contributed political cartoons and drawings for its Sunday color supplement. In 1895 he married Elizabeth North. In 1895 or 1896, he worked briefly for the Denver Times, then moved again to New York City after his separation with North, where he sold drawings to the humor magazines Puck, Life, and Judge, and drew cartoons for William Randolph Hearst's New York Evening Journal and Sunday New York American. From 1902 to 1906, Young studied rhetoric at Cooper Union in order to improve his skills as a cartoonist. In an attempt to curb this abuse, Young ran for the New York State Assembly on the ticket of the Socialist Party of New York City (Part of the Socialist Party of America, SPUSA) in 1913 but was unsuccessful. One facet of the establishment Young challenged in his cartoons and drawings was the Associated Press. His attacks became overt and damning once he joined the staff of the Masses as a co-editor and contributor. He held this position from 1911 to 1918. Young was one of the few original editorial members that stayed with the magazine for its entire run until it folded in December 1917. In July 1913, the magazine published Young's cartoon "Poisoned at the Source", which depicted the AP's president, Frank B. Noyes, poisoning a well labeled "The News" with lies, suppressed facts, slander, and prejudice. The cartoon was a response to the lack of national news coverage on the Paint Creek-Cabin Creek strike of 1912 in Kanawha County, West Virginia. The strike had lasted more than a year, and was characterized by deadly clashes between miners and militia hired by the coal companies. The coal companies were successful in having the Federal government declare martial law under a military tribunal, an egregious act according to the editors of the Masses. In 1918 Young subsequently helped to establish a similar publication to the Masses, the above-mentioned Liberator. He also served as an illustrator and Washington correspondent for Metropolitan Magazine (1912–17) until the magazine released him due to his outspoken anti-war sentiments. In 1918, Young again ran unsuccessfully for public office on the Socialist ticket, this time for the New York State Senate. 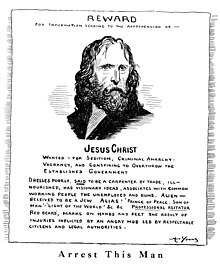 Unhappy with the way that editors Max and Crystal Eastman and a few others were able to live off the struggling magazine, while he received a nominal fee or worked pro bono, Young left The Liberator in 1919 to start a magazine of his own, Good Morning. This publication was later absorbed by the Art Young Quarterly in 1922. Young also contributed illustrations to The Nation, The Saturday Evening Post and Collier's Weekly, New Leader, New Masses, The Coming Nation, Dawn, The Call, The New Yorker (after 1930), and Big Stick. Of the many books he wrote, two, On My Way (1928) and Art Young: His Life and Times (1939), are autobiographical. Of special note are his series of drawings depicting Hell, published in Cosmopolitan magazine and in several books, including Through Hell With Hiprah Hunt, available at Google Books. He issued a collection of his drawings, The Best of Art Young, in 1936. Having Their Fling by Art Young was brought into court as evidence during the second trial in September/October 1918. Young would continue to get himself into legal trouble with his drawings during his years at the Masses. In October 1917, Art Young, Max Eastman, John Reed, Floyd Dell, Merrill Rogers, and a one-time contributor were charged under the Espionage Act by the federal government on the charge of conspiracy to obstruct enlistment. 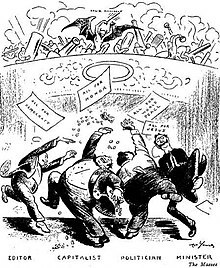 The trial began in April the following year and Young was asked to justify his cartoon "Having Their Fling" in which four men, an editor, a capitalist, a politician, and a minister are depicted dancing in orgiastic bliss as Satan leads a band of war implements. Young stated he was simply illustrating General Sherman's well-known saying that "war is hell." It seemed appropriate to Young, then, to have Satan as the conductor. The first trial ended in a hung jury. The official tally was 11-1 for conviction. The second trial began in September 1918, and it was as full of humor and irreverence as the first, perhaps more humorous for the historian than for Young. Throughout the trial, Young had the tendency to nap, an act that brought him dangerously close to being charged with contempt of court. Afraid Young would get into more trouble than he already was, his attorneys insisted he be awakened and given a pencil and pad. Young took the pencil and pad and quickly completed a self-portrait. The drawing, "Art Young on Trial for His Life", appeared in the Liberator in June 1918. The cartoon depicted Young slumped in a chair, dozing the trial away. Young's propensity for napping worked to the defendant's advantage during the closing arguments. Prosecutor Barnes, wrapped in an American flag and giving a moving speech, told a story of a dead soldier in France. This soldier, Barnes claimed, "is but one of a thousand whose voices are not silent. He died for you and he died for me. He died for Max Eastman. He died for John Reed. He died for Merrill Rogers. He demands that these men be punished." Roused from his slumber by the impassioned speech, Young exclaimed, "What! Didn't he die for me too?" The beautiful oration successfully ruined, the second jury was unable to convict or acquit. Eight jurors voted for acquittal and four for conviction. It would be the last time Young appeared in court for the charges, as they were dropped after failing twice to garner any convictions. Art Young died on December 29, 1943, at the Hotel Irving in New York City at age 77. Young's papers are housed in the Special Collections Library of the University of Michigan in Ann Arbor. ^ Arthur Henry Young, Art Young (1901). Through Hell with Hiprah Hunt. Zimmerman's. ^ Fishbein, Leslie. Rebels in Bohemia: The Radicals of The Masses, 1911-1917. Chapel Hill: U of North Carolina P, 1982. 28. Print. ^ "Art Young". The New York Times. December 31, 1943. Retrieved 2010-10-24. Art Young, who died in this city Wednesday night at the age of 77, wouldn't have liked to have it said that he was a lovable soul in spite of his sometimes heterodox opinions. He valued his opinions. He had worked them out for himself, and for them he had sacrificed the chance to accumulated a fair share of this world's goods. Hell Up to Date: The Reckless Journey of R. Palasco Drant, Newspaper Correspondent, Through the Infernal Regions, as Reported by Himself. Chicago: F.J. Schulte, July 1894. Author's Readings. Frederick A. Stokes, 1897. Through Hell with Hiprah Hunt. Zimmermans, 1901. Trees at Night. New York: Boni and Liveright, 1927. On My Way: Being the Book of Art Young in Text and Picture. New York: Liveright, 1928. Art Young's Inferno: A Journey Through Hell Six Hundred Years After Dante. New York: Delphic Studios, 1934. The Best of Art Young. Introduction by Heywood Broun. New York: Vanguard Press, 1936. Thomas Rowlandson. New York, Willey Book Co. 1938. Art Young: His Life and Times. Ed. John Nicholas Beffel. New York: Sheridan, 1939. Cohen, Michael. "'Cartooning Capitalism': Radical Cartooning and the Making of American Popular Radicalism in the Early Twentieth Century," in Marjolein 't Hart and Dennis Bos (eds. ), Humour and Social Protest. Cambridge, England: Cambridge University Press, 2008; pp. 35–58. Fitzgerald, Richard. "Art Young. "Art and Politics: Cartoonists of the Masses and Liberator. Westport, CN: Greenwood, 1961. 41-77. Hahn, Emily. Romantic Rebels. Boston: Houghton, 1967. O’Neill, William L., ed. Echoes of Revolt: The Masses 1911-1917. Chicago: Dee, 1966. Print. Sayer, John. "Art and Politics, Dissent and Repression: The Masses Magazine versus the Government, 1917-1918." American Journal of Legal History 32.1 (1988): 42-78. Zurier, Rebecca. Art for The Masses. Philadelphia: Temple UP, 1988. Spiegelman, Art. "To Laugh That We May Not Weep" Harpers Magazine, January 2016. Wikimedia Commons has media related to Art Young.